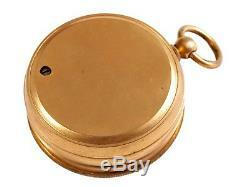 This rare Victorian antique pocket barometer is an instant heirloom. The well-weighted brass instrument comes in its original black leather case. 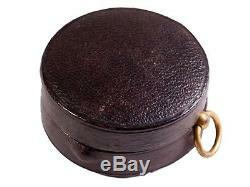 The hinged case is lined in navy blue fabric and is in very good condition. The barometer has a fob ring, and a rotation outside ring that moves a pointer to the inside scale. 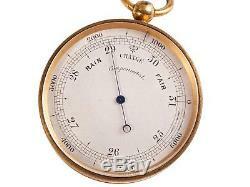 The face of the barometer says: Rain, Change, Fair, Compensated and has two sets of numbers around its rim. The instrument itself is 1 7/8" (not including the fob) x 3/4". The case is 2 1/4" x 1". 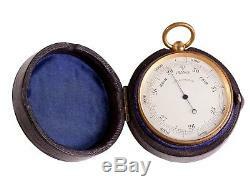 The item "FREE SHIP Antique Victorian Brass Pocket Barometer in Leather Case" is in sale since Sunday, November 4, 2018. 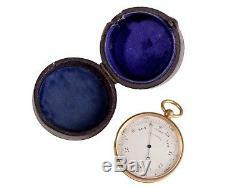 This item is in the category "Antiques\Science & Medicine (Pre-1930)\Scientific Instruments\Barometers". The seller is "lampstore-laura" and is located in Nashville, Tennessee. This item can be shipped to United States.